Hey hey kids! Krusty Burger is a fast food burger place founded by Krusty the Clown. On the TV show, Krusty Burger has disgusting food and a rude, incompetent staff. In Universal Studios Florida, the Krusty Burger has good food and a kind and helpful staff. Since opening in 2013, this quick service restaurant has become a favorite among many Universal fans, some of whom don't consider a park visit complete without a stop at Krusty Burger. Krusty Burger is located across from Lard Lad Donuts in Springfield. You'll find it inside a garish orange building that has an outdoor sign with the Krusty Burger logo on it. Inside this building is a food court that includes Krusty Burger and other Simpsons themed restaurants like The Frying Dutchman, Cletus' Chicken Shack, Luigi's Pizza, and Lisa's Teahouse of Horror. You won't find a Deep Fried Krusty Burger or any Gravy Scrapems at this quick service restaurant, but you can get a regular Krusty Burger and other dishes mentioned on the Simpsons TV show. All of the menu items are served with Kurley Fries and a pickle. If you don’t want fries, you can get apple sauce or fresh fruit instead. Beverages don't come with the meal and must be ordered separately. Options include Coca-Cola fountain drinks as well as Buzz Cola, the signature soft drink of Springfield USA. Buzz Cola is a zero-calorie, cherry flavored cola; it costs a little more than a regular fountain drink, but it is quite tasty. 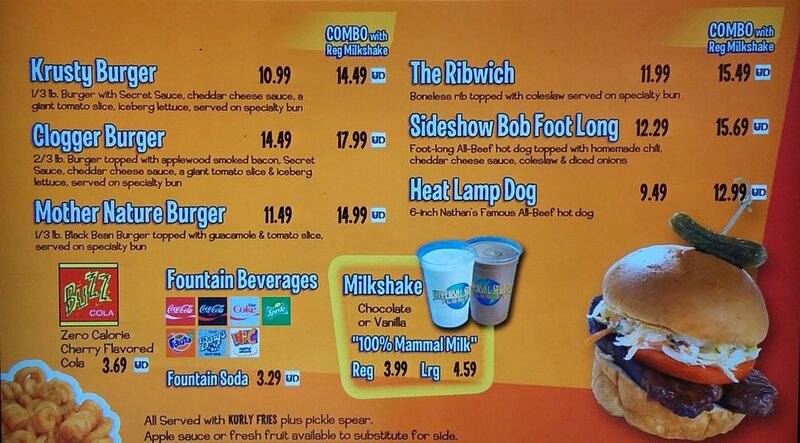 You can also get your meal in a combo with a regular chocolate or vanilla milkshake for an extra $3.50. Krusty Burger serves lunch and dinner. It opens daily at 11:00 a.m. and closes one hour before park close. Krusty Burger counter where you order food. Krusty Burger is located in a food court with other Simpsons themed restaurants. When you enter the building, you will be directed to a Krusty Burger counter where you can order your food and drinks. You will then go to a separate station where customers from all of the Simpsons themed restaurants come together to pay for their food. Once you have a tray of food, a Krusty Burger Team Member will help you find a seat. You can sit in the dining area of the food court. You can also take your tray of food into Moe's Tavern, which is located next door and accessible from inside the food court. There is also an outdoor seating area in front of the restaurant that has several tables with umbrellas. There are a few dishes on the Krusty Burger menu that we haven't tried, but we can recommend the Clogger Burger and the Krusty Burger. The secret sauce on these burgers is comparable to Thousand Island dressing. Both burgers also come with cheddar cheese sauce, which is not quite as scary (or delicious) as it sounds. The Clogger contains 12 ounces of meat, so this sandwich is best for large appetites or for people who plan on sharing a burger. No matter what you decide to get from Krusty Burger, it is best washed down with a Buzz Cola. Krusty Burger is a very popular restaurant and can get very busy. Wait times are usually minimal at 11:00 a.m. when the restaurant first opens. If you want to be guaranteed a seat in Moe's or another preferred area, visit Krusty Burger during a slow time of the day (i.e., non meal times). Episodes of the Simpsons play on a loop in the dining area. 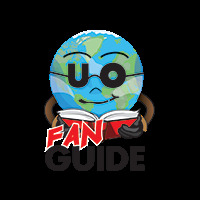 Krusty Burger accepts Universal Dining Plans. You can get refills for your Universal souvenir soda cup at Krusty Burger..
Krusty's real name is Herschel Shmoikel Pinchas Yerucham Krustofsky. In the 1990s, Simpsons creators pitched and wrote a pilot for a live-action Simpsons spin-off that revolved around Krusty, but it never aired on television. On the Simpsons TV show, Krusty Burger was named ''the unhealthiest restaurant in the world," so Krusty added the Mother Nature Burger to the menu. 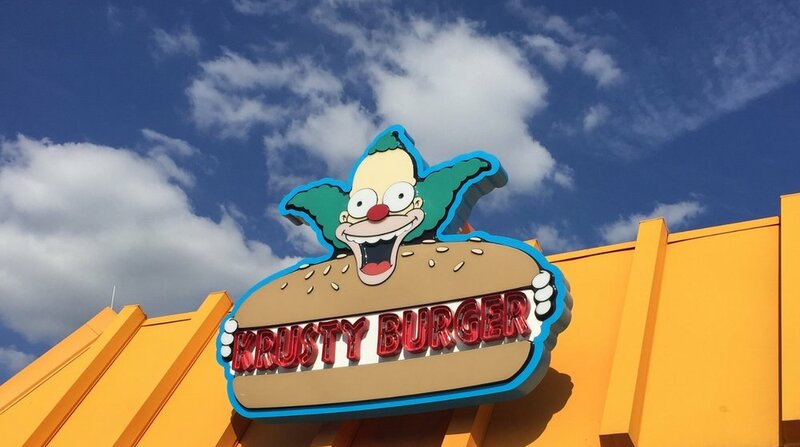 Some of the Krusty Burger menu items that didn't make it into the Universal theme park include the Meat Flavored Sandwich, the Whatchamacarcass Sandwich, Super-Choker Burritos with Macho Sauce, Gravy Scrapems, and the Krusty-Partially-Gelatinated-Non-Dairy-Gum-Based-Beverage. See more pictures of Krusty Burger.